When you have diabetes, eating healthy dinners is one of the keys to managing your health. Fortunately, having diabetes doesn’t mean you have to resign yourself to giving up your favorite meals or spending hours slaving over the stove. There are many delicious diabetes dinner recipes that will meet your changed nutritional needs without taking a lot of time out of your busy schedule. According to the American Diabetes Association, a good dinner for a diabetic is a low carb meal that contains a balanced mix of protein, vegetables, and grains. With a little preparation and creative substitution, you can create diabetic dinners your whole family will love. Here are some of our favorite diabetic dinner ideas to get you started. Stir fry dinners are a mainstay in many diabetic meal plans, because they are delicious, healthy, and easy to prepare. You can use fresh veggies including bok choy, bamboo, and mushrooms or opt for a frozen stir-fry medley of pea pods, peppers, and onions if you are in a hurry. Sauté chicken, shrimp, or lean steak strips along with veggies, in a hot pan with heart-healthy canola oil. Serve over quinoa, brown rice, or whole farro. Even deep-dish pizza can be a good dinner for a diabetic if you use the right ingredients. Brown lean ground beef or turkey and drain; combine with onions, diced tomatoes, and green chiles and layer over refrigerated pizza dough. Top with shredded low-fat Cheddar cheese, shredded lettuce, and salsa. This delicious low carb, low fat meal will satisfy your cravings for Italian and Mexican cuisine all at once. This is a great diabetes friendly dinner recipe that doesn’t require you to go shopping for specific foods. Scramble some eggs (or just the whites to cut down on cholesterol) and add in whatever fresh or frozen vegetables you have on hand. Zucchini, tomatoes, peppers, and onions work particularly well. Accompany with a piece of whole wheat toast with trans-free margarine or topped with salsa and a little olive oil to complete the meal. This protein rich dinner is an easy fix on busy weeknights. This delicious low carb meal idea from Eatingwell.com is one of our favorite dinner recipes for diabetics because it includes so many foods that are top recommendations for diabetes health. Avocado is one of the best foods for diabetes because it is loaded with fiber and healthy monounsaturated fats that have been proven to increase insulin sensitivity in people with type 2 diabetes. 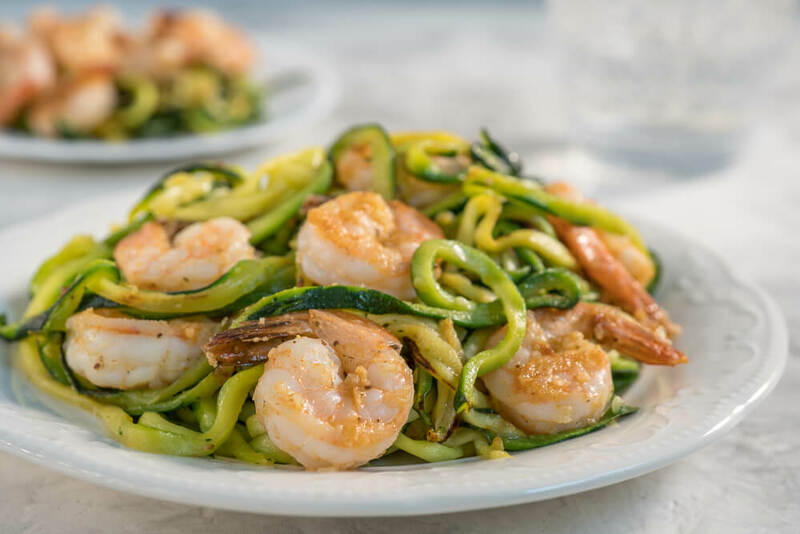 Using spiralized zucchini “pasta” in place of traditional pasta adds nutrients and vitamins while keeping carbs low. Add in the lean protein provided by shrimp and you have an ideal healthy meal for diabetics. Beans and legumes are some of the best foods for diabetics, providing a healthy boost of plant protein and essential nutrients. Before you leave for work, combine canned beans, tomatoes, tomato sauce, frozen corn, and a diced onion in a crock-pot or slow cooker. You can also add in other fresh vegetables you have on hand. Season with cumin, chili powder, and garlic, and then set to cook on low heat while you are at work. You will come home to a delicious chili meal cooked and ready to eat! You can find many more delicious diabetic recipes and quick low carb dinner ideas here on www.BetterHealthKare.com that will help you enjoy a rich, varied diet while managing your diabetes.